Susan Gunn's paintings explore and develop the medium of gesso created using sedimentary ground rock/earth. The medium is unusually resilient and fragile and is used in an innovative way as the subject of the painting itself. Traditionally, gesso is a formative ground on which to paint, produced by applying many layers of chalk or a natural earth pigment and a gelatine binder, to the canvas. Gunn makes the gesso using an ancient recipe used for centuries dating back to before the Renaissance. The material is natural and organic, not to be confused with acrylic gesso pre-made and bought in modern day art suppliers. Up to around twenty layers of the specialised paint are applied and as the gesso dries, each layer bonds with the last to form an exterior skin. Through manipulating the paint and environmental conditions, the materiality and vulnerability of the process is exaggerated. Gunn’s paintings are created through a process of mixing, layering, drying and rubbing away the surface, predominantly allowing the fissures to form naturally and, occasionally, removing and breaking the canvas manually before the act of re-stretching, embalming and repairing the the surface of a work to ensure its stability. 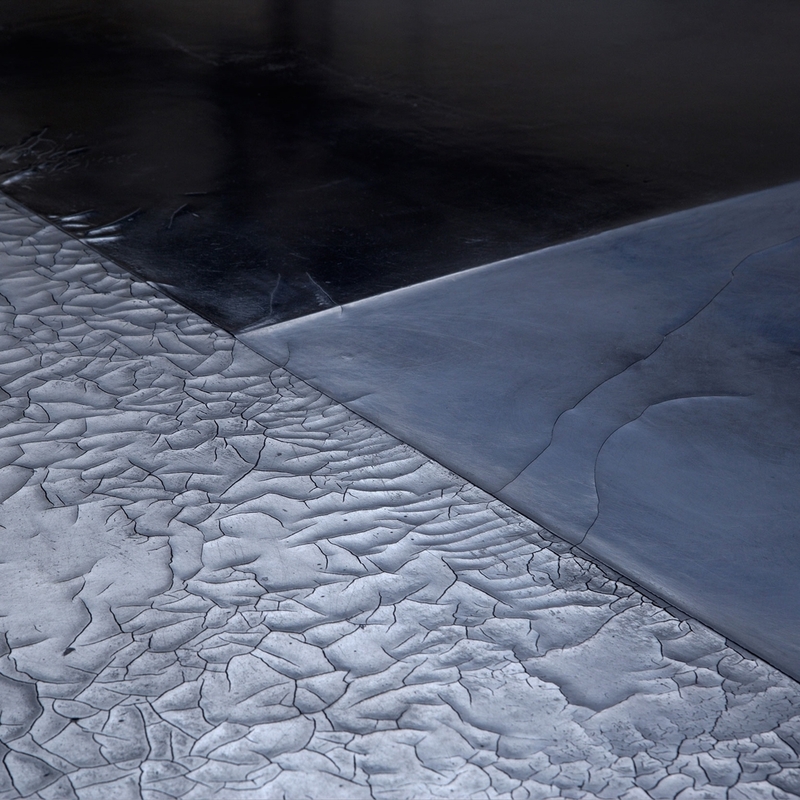 Gunn uses varying circumstances to create the fissured surfaces. Factors such as the tension in the canvas, the consistency of the gesso and the speed and temperature at which a work is allowed to dry-out combine to determine the final outcome. The exciting part of the process for Gunn is towards the end of the layering of the paint when the gesso is left to dry... as it does so, cracked areas and accidental nuances appear in the works that are ultimately beyond the control of the artist. Historically cracks appearing in newly made gesso are regarded as defects or flaw's in the surface and are said to be “entirely undesirable”(1) by the art historian Ralph Mayer. Gunn welcomes these marks as distinguishing characteristics in the works, rendering each piece unique. The strain between the prescriptive geometry and the prolonged drying of the layered paint means that the potential for uncertainty is ever present in an attempt to provoke a visual dialogue with the object of the painting. Gunn embraces the 'flaws' or marks as a phenomina. The final stages involve the grinding down, rubbing, and polishing of the surface by hand to its marble finish. The painting is rubbed with water & off-cut remnants of canvas; a process of erasure and mending to render the fissured surface stable. Some of the areas in the works are subsequently imbued with linseed and waxes. Especially fragile paintings are burned with encaustic to hold them together. The divisions and spatial outlay in the canvases are informed (sometimes subverted) by the formulae of the golden section; the regimented geometry marries defiantly against the organic free roaming nature of the fissures that appear tenuously embedded in the surface, sometimes spilling over the strict linear divisions - they refuse to be contained. The absence of imagery allows a pure meditation of the surface and material as a poesis*, in the fundamental sense, a movement of coming into thought of the process of making. The paintings evoke associating references of control and chance and embrace the beauty of the flawed. Using the unique methods she has developed Gunn has established her own vocabulary in the form of distinctive paintings, which evolve concurrently. Through their interdependency she hones this visual fluency, exploring variations of the painting process and breaking of the surface.